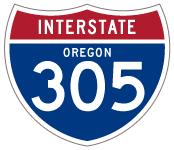 Interstate 305 was a proposed 3.3-mile long freeway spur leading southwest from I-5 into the capital city of Oregon. Salem Parkway, a controlled access, at-grade roadway, was constructed in place of I-305. The parkway follows a portion of the planned alignment for I-305 between Interstate 5 (Exit 258) southwest to the couplet of Commercial and Liberty Streets north of the Salem city center. Oregon 99E Business formerly followed Salem Parkway north to I-5 at Chemawa Road (Exit 260). The Oregon Department of Transportation submitted I-305 for inclusion in the Interstate Highway System to the American Association of State Highway Officials (AASHO) in November 19681 Interstate 305 appeared on maps between 1970 and 1975 parallel to Oregon 99E (U.S. 99E/Pacific Highway) from I-5 southwest into Salem. Early proposals placed the freeway closer to Pacific Highway between Highland Avenue and I-5. Later renditions pushed Interstate 305 further north between the one-way couplet of Commercial and Liberty Streets at Tryon Avenue northeast roughly along the Salem and Keizer city line to Interstate 5. The ultimate cancellation of Interstate 305 originated with the Federal Highway Administration (FHWA) deferring approval of Interstate 305 because of issues with the 2.34-mile southern extension. This delay pushed back the project into the early 1970s, which subjected it to more stringent environmental review (Environmental Impact Statement). Community groups gave mixed reviews on the highway, with some protesting it while others supported it. The north end of Salem Parkway partitions with ramps joining the Interstate 5 northbound mainline and the Chemawa Road off-ramp (Exit 260). Photo taken 08/27/06. A BNSF Railroad line spans Salem Parkway north ahead of the wye interchange with Interstate 5. Photo taken 08/27/06. Oregon 99E Business north formerly continued north from Salem Parkway to Chemawa Road east. The state highway converged with Oregon 99E (Portland Road), 0.9 miles east of I-5. Photo taken 08/27/06. Two lanes continue northward onto Interstate 5 to Portland. Photo taken 08/27/06. Two miles north of the separation with Salem Parkway (Exit 260A) on I-5 south at the Quinaby Road overpass in Keizer. Photo taken by Chris Elbert (11/28/04). A diamond interchange (Exit 260B) joins Interstate 5 with Chemawa Road west into Keizer and old Oregon 99E Business east to Portland Road (Oregon 99E). Photo taken by Chris Elbert (11/28/04). Entering the wye interchange (Exit 260A) with Salem Parkway south to the Salem city center. An adjacent on-ramp connects with Salem Parkway from Chemewa Road. Photo taken by Chris Elbert (11/28/04). Salem Parkway transitions into Commercial Street (former Oregon 99E Business) southbound at Liberty Street. Commercial and Liberty Streets form a one-way couplet to Downtown Salem. Photo taken by Chris Elbert (11/28/04). Salem Parkway branches northeast from Liberty Street toward Interstate 5 from the ensuing intersection. Photo taken 08/27/06. Salem Parkway leads to Interstate 5 northbound along the Keizer city line. Liberty Street continues north toward Keizer, transitioning to River Road ahead of River Road City Park. Photo taken 08/27/06.